Click here for latest Recycled Materials and Warm-Mix Asphalt Usage Survey Results. Participate in the 2018 Construction Season Survey of Asphalt Mix Producers. Not only does asphalt provide the smoothest, quietest ride, it also is the most sustainable option for paving. Over the years, the asphalt pavement industry has been a constant innovator in finding ways to make its products more environmentally friendly — from reclaiming old asphalt pavements and rejuvenating their component parts for use in new pavements to the incorporation of recycled materials to the adoption of energy-saving warm-mix asphalt technologies. As early as 1993, the Environmental Protection Agency and Federal Highway Administration identified asphalt pavement as America's No. 1 recycled product in a report to Congress. It continues to be reclaimed and reused at a greater rate than any other product in the U.S. A wide range of waste materials are now incorporated into asphalt pavements, including ground tire rubber, slags, foundry sand, glass, and even pig manure, but the most widely used are reclaimed asphalt pavement (RAP) and recycled asphalt shingles (RAS). The use of recycled materials in asphalt pavements saves about 50 million cubic yards of landfill space each year. NAPA, in partnership with the Federal Highway Administration (FHWA), is quantifying the use of these technologies through industry surveys. According to the latest survey data, during the 2017 construction season more than 76.2 million tons of RAP and nearly 950,000 tons of RAS were put to use in new pavements in the United States, saving taxpayers more than $2.2 billion. Also, nearly 39 percent of all asphalt pavement mixture produced in the country that year was made using warm-mix asphalt (WMA) technologies. As seen in previous FHWA/NAPA surveys covering the 2009–2016 construction seasons, the use of these sustainable practices has generally continued to increase. In 2017, RAP usage in new asphalt pavement mixtures reached 76.2 million tons, a greater than 36 percent increase from 2009. An additional 3.4 million tons of RAP were used as aggregate. At year-end 2017, some 102.1 million tons of RAP was estimated to be stockpiled for future use across the country. More than 99 percent of asphalt pavement reclaimed from roads and parking lots was reclaimed for use in new pavements instead of going into landfills. In the survey, 98 percent of producers reported using RAP in their mixes for new construction, pavement preservation, rehabilitation, and other projects. RAS usage also continued to be widespread, with nearly 950,000 tons being used in 2017. RAS includes both manufacturers' scrap shingles and post-consumer roofing shingles, and about 9 percent of the total supply of waste shingles nationwide are reclaimed for use in asphalt pavements. Producers were also asked about ground tire rubber, steel and blast furnace slags, and other waste materials repurposed into pavements. 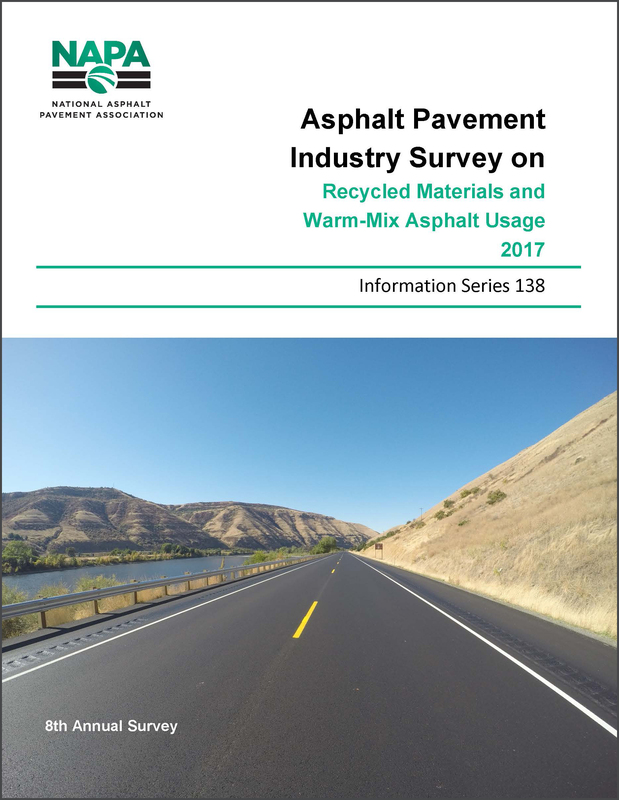 Although national estimates of usage were not calculated, survey respondents reported using more than 1.5 million tons of these materials in 2017 in the production of nearly 7.5 million tons of asphalt paving mixtures. In 2010, FHWA made warm-mix asphalt part of its Every Day Counts initiative to speed the deployment of technologies that can improve highway projects' quality, sustainability, and safety. In 2013, NAPA and FHWA were honored by the Construction Innovation Forum, earning a NOVA Award for their work promoting the uptake of WMA. In 2017, total WMA tonnage in the U.S. was estimated at more than 147 million tons, a 777 percent increase since 2009. Most WMA in the U.S. was produced using a plant foaming process, which injects a small amount of water into the mix; warm-mix chemical additives accounted for about 32 percent of the WMA tons produced.